I love hot appetizer recipes for holiday parties and year round get-togethers. This recipe for baked goat cheese with sun-dried tomatoes and herbs is absolutely fabulous. You can’t miss serving this one the next time you entertain. 1. In a medium bowl, combine the goat cheese, basil, Cajun seasoning and pepper. Spread in a greased 2-cup (500 mL) baking dish. 2. In a small bowl, combine the garlic, sun-dried tomatoes and rosemary. Layer on top of the cheese mixture. 3. Bake in preheated oven for 20 minutes or until bubbling. 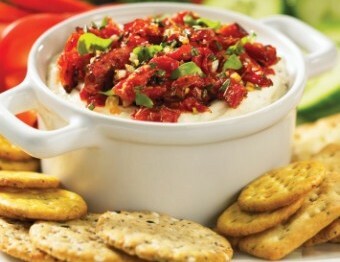 Serve with crackers or baguette slices, or as a dip with fresh veggies. For a more formal bite-size appetizer, spoon into baked mini phyllo cups and bake at 350°F (180°C) until hot. The recipe comes from a terrific cookbook called 300 Best Casserole Recipes by Tiffany Collins. Like most people Tiffany has friends and family who would turn up their nose at the mere hint of goat cheese, without ever trying it. Whether you are a die hard goat cheese fan already or not, this recipe is sure to turn you into one. This is a wonderful diabetes recipe. 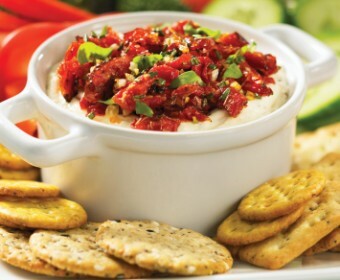 Use vegetables to dip, or a few low carb crackers. An added bonus is that it is a vegetarian appetizer recipe, and there is always someone in the group who looks for vegetarian recipes these days. If you like this recipe, I’d love you to Pin it to Pinterest, Tweet about it, Like it on Facebook and add your own fantastic recipes below. Look here for other delicious cold and hot appetizer recipes.